Central Overland California and Pike’s Peak Express (C.O.C. & P.P.) 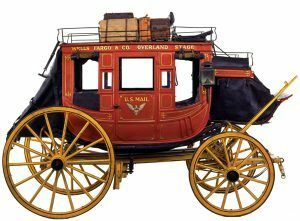 (1860-1861) – The company was formed by the transportation firm of Majors, Russell and Waddell in May 1860 when they acquired George Chorpenning’s contract for mail service from Utah to California. Also performing freighting and passenger service, it utilized partner, William H. Russell’s, equipment and portions of his former Leavenworth & Pike’s Peak Express route as well as acquiring other lines running to Salt Lake City. The company began running a tri-weekly line of coaches from St. Joseph, Missouri to Denver, Colorado, making the distance in 6 ½ days. Also owned by the firm of Majors, Russell and Waddell was the Pony Express, for which the COC&PP became the parent. Its facilities in the West Bottoms of Kansas City, Missouri were also used to outfit travelers on the Santa Fe and Oregon Trails. However, the company faired very poorly, especially from the heavy losses of the Pony Express, which became obsolete upon the completion of the Transcontinental Telegraph. Afterward, the business ran out of cash and company employees referred to C.O.C.& P.P. Express as “Clean Out of Cash and Poor Pay.” On March 21, 1862, the holdings were sold at a public sale for $100,000 to Ben Holladay. After the company went out of business its facilities became the Kansas City Stockyards.